On July 11, have a blueberry muffin for breakfast as it is National Blueberry Muffin Day. By the way, did you know that the blueberry muffin is the official state muffing of Minnesota? In America, the term “muffin” refers to a quick bread product that is similar to a cupcake in cooking methods and size. 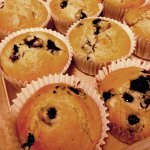 Muffins can be sweet (such as banana or blueberry muffins) or savory (such as corn or cheese muffins). They are typically baked in special muffin cups. The main ingredients of muffin batter are flour and leavening agent other than yeast or eggs (usually baking soda). It has a liquid to dry ratio of about 1:2. Muffins often have additional ingredients stirred in such as chocolate chips, berries, fruit chunks. Blueberry muffin is one of the most popular muffin varieties. To celebrate National Blueberry Muffin Day, try your hand at baking these delicious muffins. In a small saucepan, combine 1 cup milk, 1/2 cup butter, 1 1/2 tsp vanilla extract, 1 1/2 tsp orange zest. Stir over medium heat until butter melts, let cool, and beat in 2 eggs. Sift 2 cups flour, 3/4 cup sugar, 2 1/2 tsp baking powder, and 3/4 tsp salt into a bowl. Add milk mixture and stir until blended. Fold in 1 1/2 cups fresh blueberries. Divide batter among 12 muffin cups lined with paper liners. Bake at 400 °F for about 20 minutes.